I have lot of scars on my face especially from acne because I used to have lot of acne on my face. The acne healed but the scar remains. The scars and uneven tone on my face makes me feel very insecure. Once when I went to facial, the beauty parlor girl advised me to use scrub to remove scars. So, I start to search on scrubs to buy. I was scared to simply use any scrub because I was afraid it will worsen the acne. After lot of research, I found this coffee scrub by Body Breakfast. Their scrubs are 100% natural and chemical free. The reviews for their scrub were good. So, I contacted the body breakfast dropship on Instagram and told her about my problem. 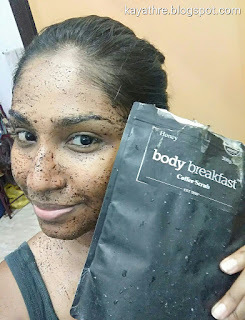 She suggested me to try Honey Coffee Scrub because it will help for my acne. Actually, they have variety of coffee scrubs. I decided to give a try and made my order. The 200g scrub was RM75.99 with a free small scrub and free shipping. Their service was so fast that I received my product on the next day itself. I started to use this scrub on my face twice a week. Everytime after I use this scrub, I can feel my skin is soft and smooth. And, I can see my face glowing too. About the scars, I received comments from my aunty that my scares faded a lot compared to before. Most important thing is this scrub did not trigger acne on my face. So, it is very safe on skin. Apart from this, I just love this coffee smell. Every time when I use this scrub, I feel very calm and relaxed.